You can take 1 piece of Sukhdi in your daily breakfast, its best for growing kids, and very healthy as well. I already have shared similar 3 ingredients recipe Whole Wheat Halwa, in which I have included all benefits of these 3 ingredients I have used for making this both recipes. Honestly speaking, I have mastery in making this recipe. If you take one piece of my Sukhdi, you will definitely hungry for more. And the real challenge for me is to make you the master of this Sukhdi recipe. Because I am saying this is Quick but not easy. Don’t worry; I’ll give you some extra tricks and tips. Now let me tell you, why this recipe is not easy. Sometimes it becomes so hard that you cannot cut it or even chew it. 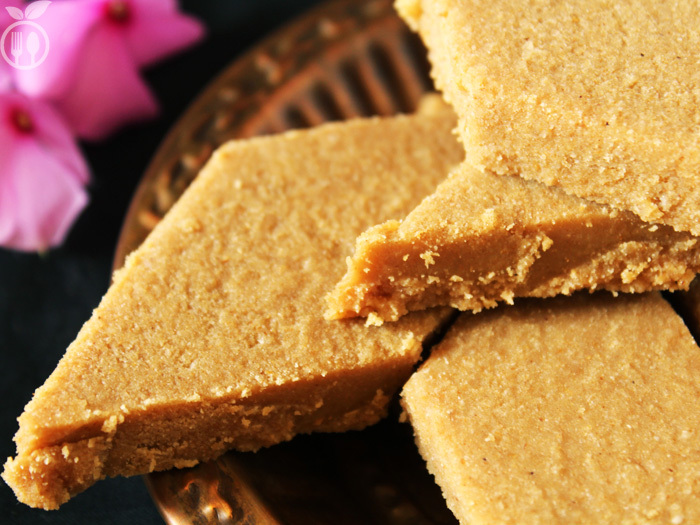 Because type of jaggery you use in this recipe also matters. And if you are making this recipe in larger quantity, then roasting time will be increased. Most important part or I can say heart of this recipe if perfection in roasting the flour. So are you ready to be master of this recipe? 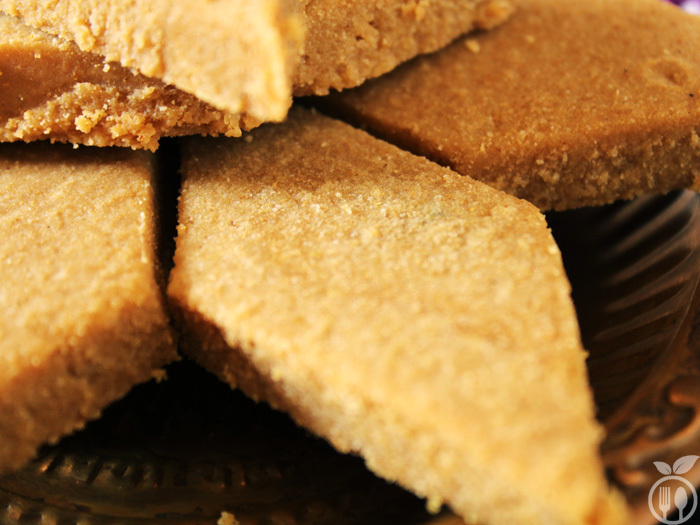 Sukhdi Recipe is also referred as Gud Papdi Recipe in India. 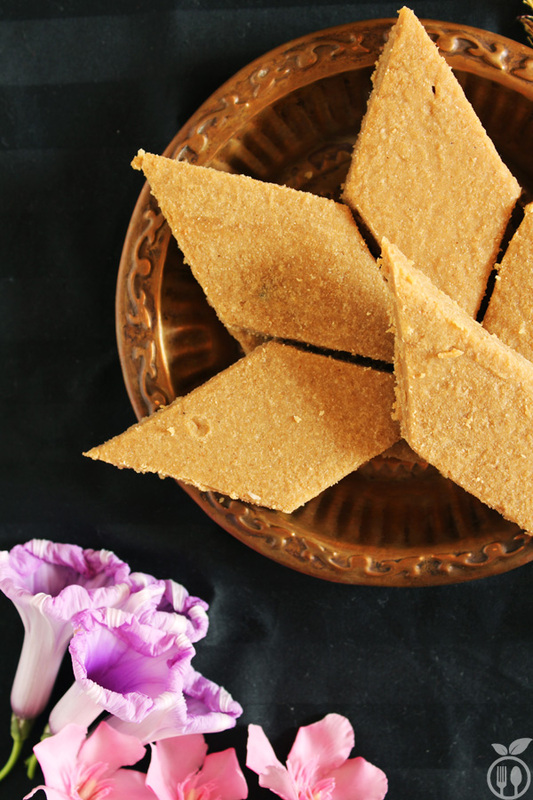 It is very quick, authentic Gujarati sweet made with just 3 ingredients: Ghree, Wheat Flour and Jaggery(Gud). Sukhadi is very soft, melt in mouth texture. First prepare the plate to set the sukhdi. You need to grease the bottom of plate by ghee. Put ghee into large non-stick pan. And melt it on slow flame. When ghee is slightly hot (bubbles are started to form), add flour wheat flour. Stir with spatula, the mixture looks like thick paste and feels heavy while you are stirring it. Now roast the flour into ghee, if ghee is not enough to roast the flour, you can add more. First add 1 tbsp, then if you still required then add one tbsp one by one. Stir it continually on medium heat for 4-5 minutes, then slow the flame and keep starring. Now its tricky part. How you would know the flour is perfectly roasted? If The flour’s color gets darker, It gets very nice aroma and Its become lighter than before. Now turn off the gas. Let it be cool for just 1-2 minutes, not more than that. After this add jaggery, quickly mix it with flour. Add dried ginger powder, desiccated coconut if you like. They are totally optional. Now quickly set the mixture into greased plate. And flatten the surface well. Now using knife slice it into desired shape (square or diamond). Now let it be cool completely. After it cools down completely, remove the pieces gently and serve. 1) Sukhdi tastes best when you served it hot. 2) I have used organic jaggery; it always comes in a lumpy form. But of you have block of jaggery, then first grate it or make it like powdered form and take measurement accordingly. So there no chunks are there in final sukhdi pieces. First thing is quantity of ghee (clarified butter), you must take 2/3 amount of ghee as against flour. So if you take 1 cup flour, take 2/3 cup ghee. You might be thinking that, OMG, it’s too much! But it helps to roast flour perfectly, and also give it melt in mouth texture to sukhdi. 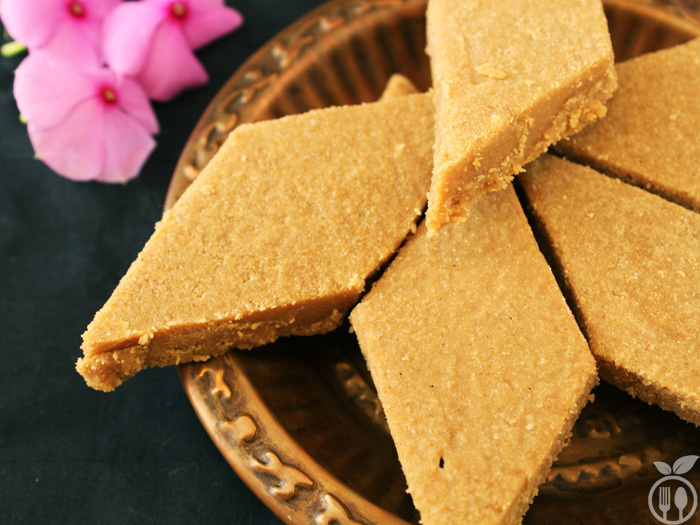 Second point is which type of jaggery, you are using for this recipe. There are lots of verities of jaggery available in the market. If you have organic jaggery that comes in lumpy form while you buy from market, after roasting the flour, switch of the flame, wait for 2-3 minutes. Let the mixture cool down not completely, but little, than add this kind of jaggery and mix it well. If you add jaggery at early stage then it will melt and starts to boil, result will be hard and chewy sukhdi. Third point is how you can identify that flour is cooked perfectly. It’s become lighter than while at the beginning you have started to star it. Thanks Reena, I will try it out.. Superb, awesome, just as my mother used to make. God Papdi came out so well and yummy. I had guests and they just loved it! Every piece was gone ! Ravi, Thank you so much for your wonderful feedback… 🙂 This is my favourite dessert!!! you can also try more recipes!!! 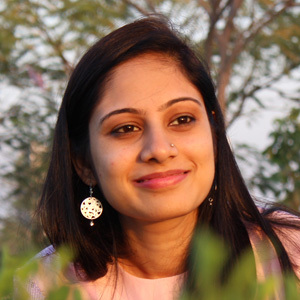 Hi Shreeya, I am also big fan of Sukhdi, I am damn sure if you follow this recipe, you will get same result as you have tasted sukhdi of Mahudi. Please try it and send me feedback. This is my first attempt and I get successful. Thanks for the recipe. Hey not sure about the measurement of ghee against flour. Recipe says 2/3 against 11/2 cup of flour and note under the recipe say 2/3 against 1 cup of flour so which is right? Hay Ranna, generally It’s 2/3 against 1 cup flour, But I have used 2/3 cup against 1 and 1/2 cup in that recipe only because it was quite thick. My best suggestion is if your ghee is at room temperature (in total liquid form like any oil) use 2/3 against 1 cup. but if the ghee is little bit thicken, then use less then 2/3 against 1 cup flour. I usually prefer more ghee in my sukhdi. So I always add one tablespoon more in my sukhdi. You can adjust it as per your taste, but use at least proper amount of ghee to roast flour properly, otherwise flour might be burnt. Can I liquify jaggery by adding little ghee and heat for 1-2;mins. That will be easy to mix. No no, Sandeep. Usually that is a mistake done by majority of the people. Do not add heated jaggay, it will make your sukhdi chewy and hard. I made it for the first time using your recipe and nailed it well. It is tasting yummy and had no tragic outcome like my earlier experiments with other recipes . Thanks for giving such detailed description. I had tried your palak panner recipe too and that’s why I came to this website out of all the earlier pages I got in my search result . And by the way the Palak paneer was also perfect. Thank you so much Reshma. keep visiting for more exiting recipes.